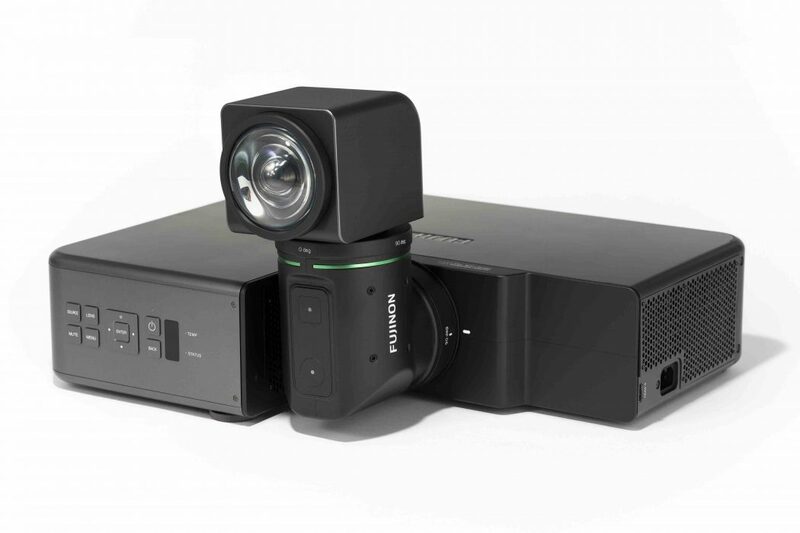 FUJIFILM has launched the world’s first* projector equipped with a high-performance, rotating FUJINON lens that can project images in various directions without moving the main unit. 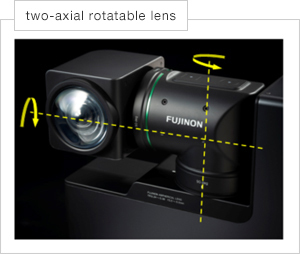 The new projector features the world’s first “two-axial rotatable lens,” newly designed with FUJINON lenses’ cutting-edge optical technology. The lens can face up, down, front, rear, left and right to project images in various directions without having to move the main unit. This means it can project images not only on a wall or screen but also on the ceiling and floor, and can easily switch between vertical and horizontal display. The use of an ultra-short throw lens and laser light source also makes it possible to project bright and clear images on a 100-inch screen from a distance of just 75cm**. The device can be placed horizontally or vertically according to users’ environment. Sporting a sophisticated product design, the projector features beautifully rounded corners and a compact body that turns into a box shape when the lens is folded in. The new Fujifilm projector will be an ideal choice for large-scale digital signage at retail stores or spatial design projection at art galleries and museums, where installation space is limited, or for image projection onto ceilings or floor to make effective use of available space. Today projectors are used in a wide variety of situations including theatres, offices and educational institutions. More recently demand for projectors has increased due to their applications in digital signage at commercial facilities or design projection at art galleries and museums. This has increased the need for projectors that can be used for effective advertising in limited space, and spatial presentation using walls and ceilings. FUJINON lenses are used in some of the most advanced technology currently on the market including 4K/8K compatible broadcast lenses, high-performance cine lenses and interchangeable lenses for mirrorless digital cameras. 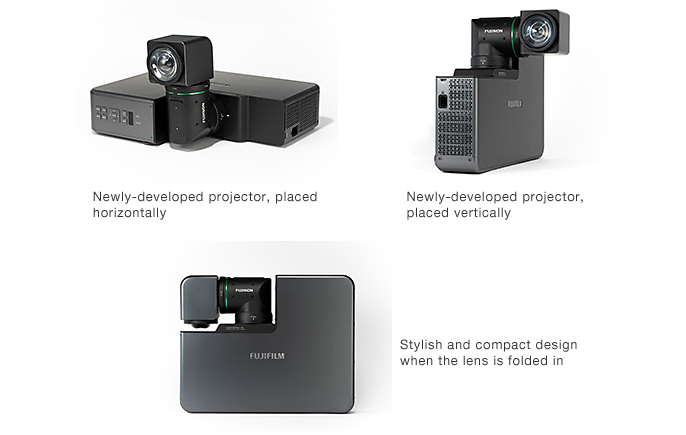 By tapping into its advanced optical design technology, accumulated through the development of these types of optical devices, Fujifilm has developed an innovative projector that meets the current market needs. The use of the world’s first “two-axial rotatable lens” gives this projector the capability of directing the lens up, down, front, rear, left and right to project images in various directions without having to move the main unit. This means it can project images not only on a wall or screen but also on the ceiling and floor, and easily switch between vertical and horizontal display. The use of the ultra-short throw lens makes it possible to project images on a 100-inch screen from the close distance of just 75cm. 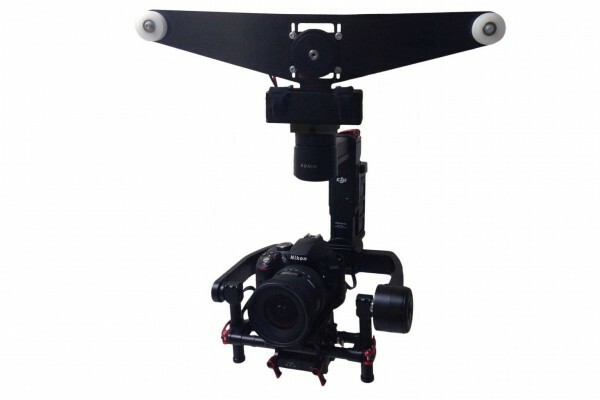 The device can project dynamic images even when there is constraint in projection distance. The projector can be placed horizontally or vertically for greater freedom in installation according to the users’ environment. It has a small footprint of 0.18m2 when placed horizontally and just 0.05m2*** when placed vertically. Smart appearance and sophisticated product design with beautifully rounded corners and a compact body that turns into a box shape when the lens is folded in. ***When positioned vertically, the projector must be fitted with a stand to prevent it from tipping over.